President Barack Obama really likes him, even added the inflection “really.” Some think he may be the next generational talent in the NBA, LeBron James’ successor. That’s all well and good but neither the president’s praise nor the feelings of pending superstardom mean this stuff will come immediately to Ben Simmons as a member of our Philadelphia 76ers. The key to analyzing Simmons is to first establish what the realistic expectations for his rookie season are. He isn’t going to be LeBron right away; he almost surely won’t even have the kind of rookie season Lebron had for the Cavs. “The King” was beyond amazing in his first season straight out of high school. So what can we expect from Simmons during his rookie campaign? The 76ers roster around him is not good and not designed to help him out for one. It is a collection of assets and not much more. There are five frontcourt players who, at one time or another, were considered potential franchise guys. They all cannot play together. There is no elite point guard either. That position will likely fall to some combination of Jerryd Bayless (a combo guard) and T.J. McConnell (a borderline backup). Unless Simmons is able to somewhat solve both issues. Sixers coach Brett Brown has indicated that Simmons is going to play some point guard his rookie season. That would free up the frontcourt logjam to some extent while also providing a highly intriguing point guard to the rotation. Part of the draw of selecting Simmons with the No. 1 overall at Draft16 was the versatility and guard skills he owns that are housed in a 6-10 body. Of course, there are caveats. This may be a case of exaggeration where Simmons will simply have the freedom to run with rebounds and not actually run the offense. Also, he is a poor outside shooter for a power forward; his shooting for a would-be point guard is untenable. Simmons is a great passer though, a skill he has already put on display during summer league. That opens up the door for a scenario similar to how the Milwaukee Bucks use Giannis Antetokounmpo. Simmons may even be a better passer and facilitator than that, though perhaps not as elite of an athlete. Nevertheless, there will be tons of turnovers if Simmons finds himself running plays. It will just be the nature of the beast. So, thus far, we have a mismatched roster surrounding a rookie who could be playing a new position that will cause him to make tons of mistakes. This doesn’t exactly breed confidence…which is exactly the point. Things could get ugly for both Simmons and Philadelphia in 2016-17. That doesn’t mean either is a failure. It is all a process, though a much different one from “the process” Philadunkia nation grew used to. 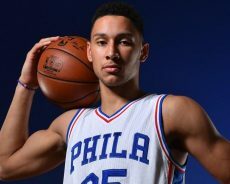 What we need to see out of Simmons as a rookie is a high comfort level all over the court. That may happen by game two. It may not happen until February. Whatever the case, we want to see that he is comfortable and effective from inside and outside, with and without the ball. That versatility is one of the pillars of his game. We also need him to be a quality rebounder. Rebounding is one of the most translatable skills and stats from college to the pros. Simmons averaged 11.8 rebounds per game as a freshman at LSU and over 12 rebounds per game in high school for basketball factory Montverde Academy. He won’t get there in the NBA right away, but he should be able to grab three to four rebounds per half right from the get go. If playing his position, the turnovers won’t be something to worry about, and neither will the scoring. It is possible to conceive of Simmons averaging anywhere from 10 points per game to 26 points per game. It is hard to tell at this juncture not knowing what his usage rate will be and how the offense will be established. The former would not represent a failure just as the latter wouldn’t mean unimpeachable success. It is more about how Simmons performs than what his box score looks like at the end of each night.